It doesn’t get any purer than distilled water. No other water is devoid of all contaminants known to us—bacteria, viruses, heavy metals, inorganics, chlorine, fluoride, and more. But is it really healthy for you? Paul and Patricia Bragg’s book The Miracle of Fasting brought the idea of drinking distilled water to the attention of health seekers all over the world. Many people took the Braggs’ advice and some have stuck to this practice ever since. Being the cleanest possible water, distilled water takes nothing out of your body except what shouldn’t be there—impurities and toxins. Many health activists argue that the practice of drinking distilled water cleanses the body, from the organs right down to the cellular level. Hilton Hotema, in Man’s Higher Consciousness, claims distilled water and rain water are the only forms of water fit for human consumption. Dr. Brian Clement, the director of Hippocrates Health Institute, reports he’s been drinking distilled water for 35 years, and his bone density is that of a 22 year-old athlete. And David Klein, a hygienic doctor and the editor of Vibrance magazine who credits the raw vegan diet for his recovery from ulcerative colitis, also recommends distilled water as his drink of choice. But there are those who challenge distilled water’s claimed benefits. With the spread of new kinds of water treatments, distilled water has fallen out of grace. The water business is huge—U.S. figures in 2012: 9.7 billion gallons, 11.8 billion dollars. Big money always means big controversies. One of these: that distilled water brings on tooth decay, because it lacks the fluoridation found in most North American tap water. However, many dentists and natural health promoters view the lack of fluoride as a plus for the distilled water, because the various dangers of fluoride override any tooth decay prevention benefits. Other arguments against distilled water include that it contributes to electrolyte imbalance and osteoporosis. These claims shouldn’t be taken at face value but should be empirically researched, and this has not been done. Second, there’s counterevidence, and there are good counterarguments. For one: the best way to get your electrolytes is through eating raw foods. Also, you will hear that “distilled water has been stripped of ‘essential minerals.’” The distillation process, they argue, renders distilled water unstructured. True, so far as it goes. But, it is food, not water, that should be our prime source for metabolically accessible minerals. The American Medical Association agrees. Make your water structured, if you like, by following one of many recommended methods—leave it for a few hours in the sun, expose it to a vortex, or add a few drops of fresh- squeezed juice. Distilled Water… Neutral or Acidic? The pH scale, you’ll recall, is a way of representing mathematically the degree of acidity or alkalinity in a solution. 7 is the point of neutrality on the pH scale. Distilled water is a perfect 7—so long, at least, as it’s in a glass bottle and not yet opened. But expose it to air, and that distilled water starts absorbing CO2, carbon dioxide, and the water’s pH gradually begins dropping, going in the acidic direction. Some hold this against distilled water. But keep in mind, acidic water is also known to be very good for sanitizing, and for assisting in healing wounds. “There's no absolute medical proof that drinking distilled water will cure arthritis, heart disease, high blood pressure, hardening of the arteries, or any other dozens of infirmities that humans suffer. There's no absolute proof that drinking distilled water will remove kidney and gall stones, reduce cataracts or cure emphysema. But, there are hundreds of case histories of people who have enjoyed success in alleviating or overcoming these health problems when they began drinking distilled water exclusively.”-Clifford C. Dennison, Ed. D., Associate Professor at Lee College, and lifelong water researcher. It is hard to find large academic studies that focus on finding benefits of drinking distilled water. Why? I believe it’s because the current market for distilled water comprises such a small part of the water business that no one wants to fund the research. But don’t let that stop you. Conduct your own research and then decide what is the right decision for you. Anecdotal, experiential evidence is the best evidence we have to work with at the moment. And mine says: Go distilled. Now, do hear me clearly: I’m not saying other water treatments aren’t good. Some of them certainly sound impressive with names such as “reverse osmosis triple filtered.” But I haven’t tried them, so I don’t know. What I do know comes from my experience. I’ve never met a person who said distilled water harmed him, but I’ve met many who credit it for their improved health. 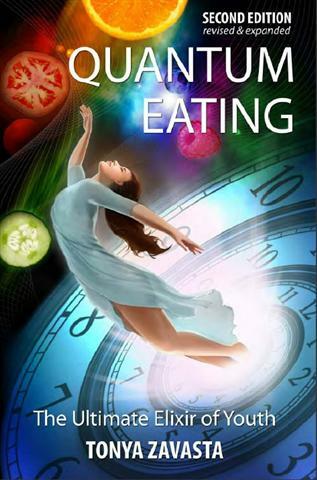 Before adopting Quantum Eating, I followed the raw food diet and drank distilled water. I performed weekly 36-hour water fasts, always using distilled water and I achieved great results in restoring my health. Even now, I always soak raw nuts in distilled water before eating them. 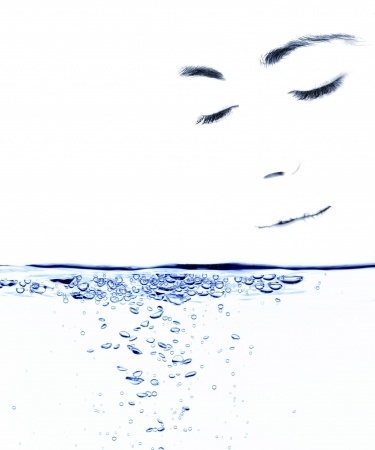 Even critics of distilled water acknowledge that it creates a powerful cleansing effect in the body. That very cleansing is just what you need as you transition to raw foods. Distilled water is the ideal choice during this time. I’ve known several people who drank distilled water for twenty years or more and restored their digestive system to top condition. Some even cured themselves of life threatening illnesses. But I believe wholeheartedly that optimum health will show in your appearance, and I’ve noticed that people who drink distilled water but do not make the change to living foods usually lack the glow, the visual vitality possessed by those who practice daily vegetable juicing. I’m put in mind of a Russian fairy tale…A beautiful maiden sprinkles “dead water” onto the mutilated body of her beloved prince to heal his wounds, then she applies “living water” to restore his life. Frightfully unscientific, obviously. But this analogy is nonetheless apt for explaining how I view the place of distilled water and freshly squeezed vegetable juices in achieving superior health. We need them both during the transitional period. Obtaining distilled water is very easy these days. Just about every supermarket, grocery store, or pharmacy carries distilled water in their bottled water section. If hauling water from the store is not your thing, another option is to sign up for delivery service with companies like Culligan (www.culligan.com) or DS Waters (www.water.com), and the water will be delivered to your doorstep. Many people find that they prefer instead to invest in a water distiller and make distilled water at home on a regular basis. Either way, do your homework first, and make an educated choice when it comes to selecting the equipment that will be making your drinking water for you and your family day in and day out. Acquire superior health and a youthful glow. Eventually, as you complete your transition, you may find you need to drink little or no free water at all. That’s part of what Quantum Eating is all about. Since I eat only whole raw foods, I get all the water I need entirely from my food. Tomato, cucumber, melon, berries…you name the raw food, and it’s already mostly water, in weight and volume. Between the fruit or vegetable itself and the water within, you’re getting all the electrolytes, nutrients and minerals you need, intact, Nature’s way. I believe drinking distilled water will prepare your digestive system for raw foods and will assure your raw success. If you follow a sensible raw food diet/lifestyle, then you get more than sufficient minerals from your food (as I discussed in the article: What is the Best Water?) I’m past fretting about the best water to drink. I’m getting the best water ever — in nature’s vessels. For health, for a glowing complexion, for energy—you just can’t do any better than that.